If you are correctly interpreting the chart, it shows the nine major assets classes (we use them all) and an asset allocation somewhat similar to ours. So in 2006, REITS, which we have, did stellar (35.1%). In 2007, they were the worst (-15.7%). In 2008, cash was second best, and in 2009, cash was worst. Similarly, in 2008, emerging markets did terribly at -53.2%, followed by being the best performer in 2009 at +79%. The last column shows the annual return of each class. It’s interesting to note that over 10 years, the asset allocation portfolio did just slightly less than the S&P 500, with considerably less risk (it’s about 35% fixed). 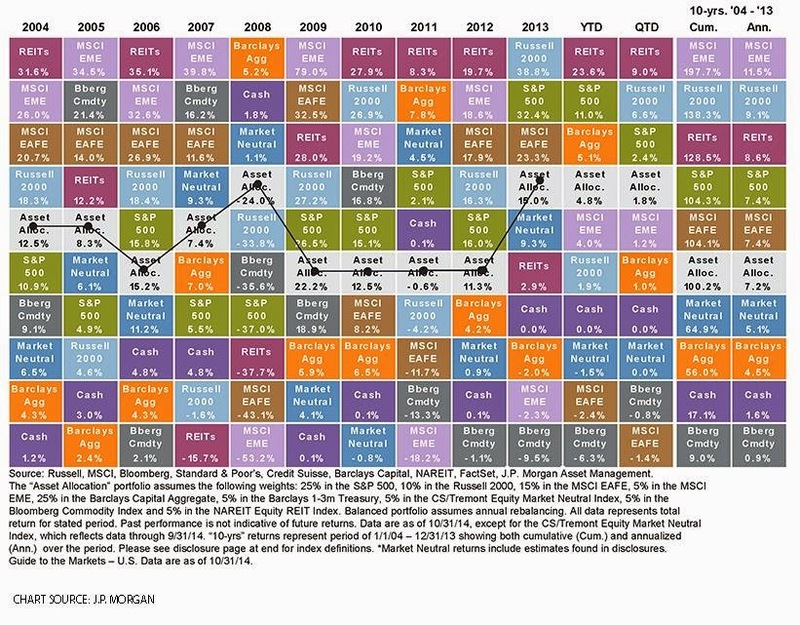 The point of this chart is straightforward: no single asset class ever dominates the chart, and frequently the top performer slides to the lowest performer. If you look closely, the light blue ‘allocation’ mix was in the middle-upper portion of the table the entire ten year period, and this holds for longer periods as well. That’s the strategy of asset allocation: don’t try to hit the ball out of the park, win the game. And the sweetener? Rebalance it so that you take profits off the highest asset classes and buy more of the lowest performing asset classes. One last note: Cash, as we all know, is not really an investment, but a form of liquidity and a protector. Note the relative position of cash in the long run.